I have never had a smoother Monday before. Or so was I thinking until I came across a story on Instagram that made me uncomfortable. Wait, I'll show you the Insta story. 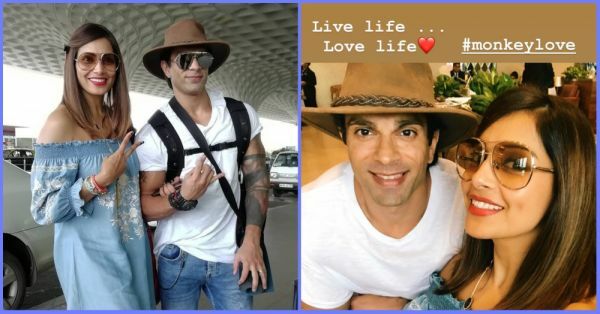 Bipasha Basu and Karan Singh Grover are on their way to Goa for a friend's birthday celebrations and we can't come to peace with Karan's hat. Here's a picture of the couple at the airport. We get it that you're going on a tropical vacation but a cowboy hat? Why, Karan? We are a big fan of the classic blue jeans - white shirt ensemble and pairing that with white sneakers makes it even cooler. Talking about the rugged street-style theme going on with the bracelet and wrist watch - that's fine too! But the cowboy hat with mirrored sunglasses - me no likey! Here are two alternatives in which the ensemble could have been pulled off, without offending the cowboys (and Texas). Instead of browline sunglasses which are looking OTT, the classic aviators would have been a better choice. We are saying the black tinted lenses with a slim golden frame, you know, the ones Tom Cruise wore in Top Gun. You could also trade the white sneakers for combat boots for an overall tough look. Wearing sneakers with a cowboy hat is like drinking chai with ice cubes in it. An easier alternative would have been to not wear the hat altogether. A simple baseball cap would have been just fine. Throw on a cool scarf to nail the beach boy look, if you love accessorising.